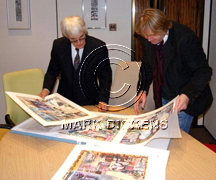 Mark Dickens was commissioned by Bernie Ecclestone to create 19 paintings, one for each Grand Prix. 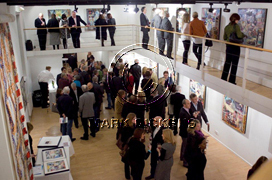 The works were individually created and finished by Mark Dickens. They are mixed media panels which involve the use of print, paint, fabric, photographic transfers, embellishments and hand-written text set into resin on marine board panels. Incorporated within each of the twenty works are iconic images from around the city and images taken directly from each race week. See the gallery. The commission showcased the beauty and dynamism of each host city and circuit-season 2011, blending the unique world of Formula One™ with the cultural and architectural significance of each city. Also featured are collaborations with the CEOS Sponsors, City Mayors and other Dignitaries, who were invited them to handwrite a quote explaining their unique interests in the race. These handwritten quotes feature in the artwork. The Sponsors logos also feature in the artworks. Acclaimed artist Mark Dickens has created a series of 19 original works of art that encapsulate Formula One™ ’s relationship with race-hosting cities, circuits and leading partners involved in the sport.